#MoviesMusicPlaysFilmFestivalsConcerts: Oscars 2015: My Prediction! The OSCARS in 3 Days! Yesterday, i posted in my Twitter and Instagram accounts my predictions in the 8 major categories. In that, I had "Birdman" winning Best Picture and "Boyhood" director Richard Linklater for Best Director. Today, I am reversing that and calling the race again for "Boyhood" to take Best Picture and "Birdman's" Alejandro Innaritu for Best Director. Now, if the opposite happens or if "Boyhood" takes both, i will be most happy. But if "Birdman" wins both and Michael Keaton upsets Eddie Redmayne, i will probably be bitching about the results all day Monday. LOL! My predictions below! Clear your Sunday sked. Watch the Oscars!! MANILA, Philippines - It’s that time of year again! On Sunday, Feb. 22 (Monday, Feb. 23, Manila time), the Oscars will once again bring movie lovers together for three hours of sheer movie fun. The 87th Oscars will be telecast live to over 100 countries and is expected to attract over a billion viewers! And those billion viewers are probably still as perplexed as this writer is right now on which one movie will be rewarded by the Academy this year. 2014 was not a particularly strong year for Hollywood movies. Only a handful made an impression and that has been reflected by the wildly diverse selections of several Oscar precursors. Traditionally, about this time, we should have had a clear frontrunner leading to the show already but not this year. The Screen Actors Guild, the Directors Guild and the Producers Guild all picked Birdman or (The Unexpected Virtue of Ignorance) as the year’s Best Film. However, the BAFTAS, the very influential British bloc of the Academy, selected Boyhood as their Best Film. The critics were not of much help either. The BFCA, which for years has been considered as the most accurate predictor of the Oscars, selected Boyhood as their Best Film. The New York and Los Angeles Film Critics also named Boyhood as the year’s best. So with no clear frontrunner for the all-important Best Picture prize, this writer will pick what he believes is the better movie between the two. Expect Boyhood to win the top Oscar but the Best Director trophy could go to Birdman director Alejandro Gonzales Innaritu. The picture/director awards will be split between the two films again similar to last year. It would be interesting to see two Mexican filmmakers win Hollywood’s top directing prizes two years in a row. Alfonso Cuaron won last year for Gravity. On a personal note, this writer would love to see Boyhood’s Richard Linklater rewarded with a win for his 12-year labor of love. I hope the Academy shares my sentiments. The nominees for Best Picture are: American Sniper, Birdman, Boyhood, The Grand Budapest Hotel, The Imitation Game, Selma, The Theory of Everything and Whiplash. The nominated directors are: Innaritu for Birdman, Linklater for Boyhood, Bennet Miller for Foxcatcher, Wes Anderson for The Grand Budapest Hotel and Morten Tyldum for The Imitation Game. While the Top 2 categories are pretty difficult to call, the acting categories will likely just end up as a coronation night for the four actors who have virtually swept all the awards haul this Oscar season. 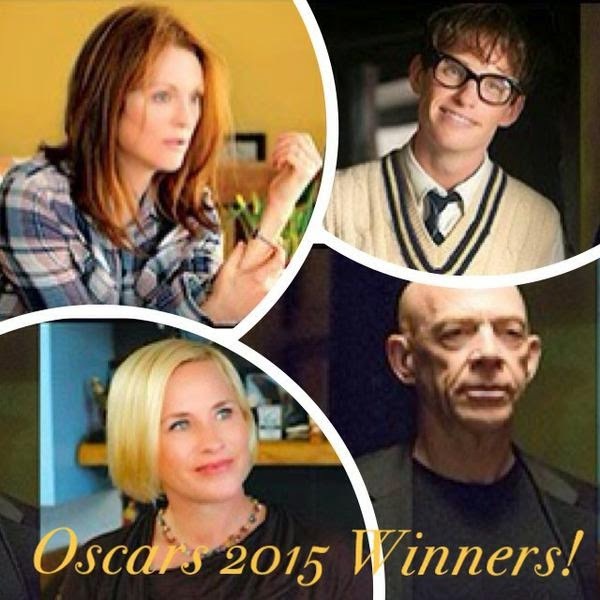 Acclaimed actress Julianne Moore will win Best Actress for Still Alice. The beautiful star has been overdue for an Oscar and this year is going to be hers. Her performance as a mother and wife trying to cope with the onset of Alzheimer’s disease has been widely acclaimed since its debut in September. Her main competition in the category are previous Oscar-winners Reese Witherspoon for the very moving film Wild and French superstar Marion Cotillard for the brilliant film Two Days, One Night. Two Brits complete the nominees: Rosamund Pike for Gone Girl and Felicity Jones for The Theory of Everything. In the Best Actor category, Felicity’s co-star and fellow Brit Eddie Redmayne is tipped to win the category for his excellent portrayal of wheelchair-bound astrophysicist Stephen Hawking. His performance has drawn comparison to Daniel Day-Lewis’ Oscar-winning turn in My Left Foot. Veteran Hollywood player Michael Keaton is the dark horse in this category. The former Batman star whose performance as an over-the-hill actor trying to stage a comeback in Birdman has resonated with Hollywood insiders and he could just earn the trophy and stage his own career comeback. The three other nominated actors are Steve Carell for Foxcatcher, Bradley Cooper in American Sniper and Benedict Cumberbatch in the heartbreaking film The Imitation Game. In the supporting categories, two veteran actors, who rightfully deserve all the honors and accolades for their compelling performances and for their impressive body of work as well, have staked their respective claims in their categories very early on in the race. Patricia Arquette, who aged 12 years on screen for her role in Boyhood, has racked up virtually every trophy available this season. Her performance has inspired so many that perhaps the other actresses nominated alongside her end up voting for her, too! The other actresses nominated in the Best Supporting Actress category include Laura Dern for Wild, Keira Knightley for The Imitation Game, Emma Stone for Birdman and the acting goddess Meryl Streep, who is nominated for an unbelievable 19th time this year for her performance as a wicked witch in Disney’s Into the Woods. For Best Supporting Actor, J.K. Simmons is expected to receive his Oscar on his first nomination as a stern teacher who expects nothing but greatness from his students in Whiplash. Other actors nominated in the category include Robert Duvall for The Judge, Ethan Hawke for Boyhood, Mark Ruffalo for Foxcatcher and Edward Norton whose performance in Birdman poses the biggest competition to Simmons. This year, the one category that this writer is most excited about is the Best Foreign Language Film category. All the five nominated films are excellent works and each one deserves to win. But my heart was captured by the Argentine film Wild Tales when I saw it last December. It’s one of those rare films that combine all the elements of a commercial film and the quality of an art film. Its biggest competitions are the films from Russia, Leviathan, a tale of Russian corruption based on the parable of Job and the Polish entry Ida, the story of novitiate nun who discovers that she was Jewish on the eve of her dedication. Ida has been the frontrunner since day one and is likely to win. The other nominated films are the harrowing Timbuktu from Mauritania and the powerful anti-war film Tangerines from Estonia. But Wild Tales will win. Fingers crossed. With no particular film leading the Oscar race this year, the trophies will most likely be spread among five movies. The Grand Budapest Hotel, which is nominated for nine Oscars will likely end up with the most trophy with four. Birdman and The Theory of Everything will likely net three trophies each. Interstellar, the disappointing sci-fi from Christopher Nolan, will sweep the technical categories and will likely win three Oscars. Boyhood will likely end up with just two Oscars. Among the announced performers this year are pop superstars Lady Gaga and John Legend. Neil Patrick Harris, known to many Filipinos as the Doogie Howser M.D., will be hosting the Oscars for the first time this year.